WiMax delivers our top quality Internet service through the air. 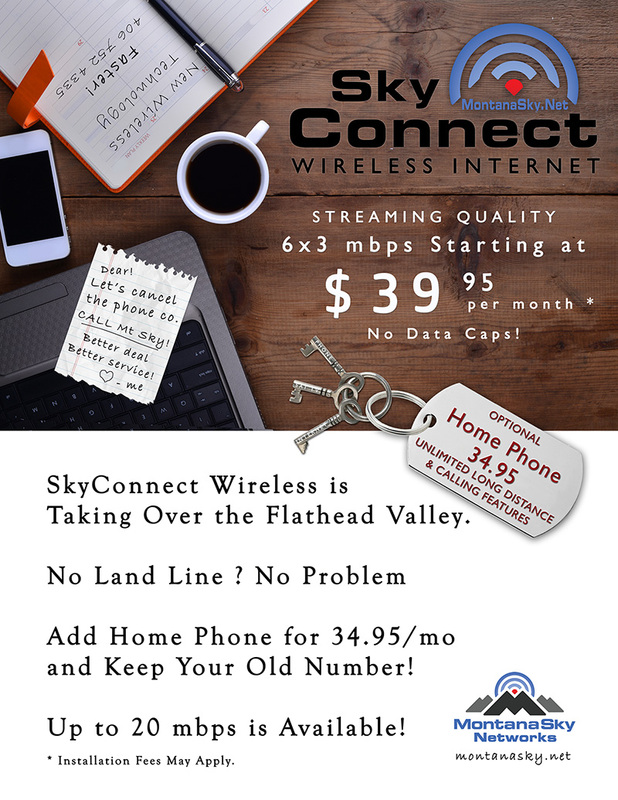 SkyConnect Wireless is a new and improved line-of-sight Internet connection from MontanaSky. 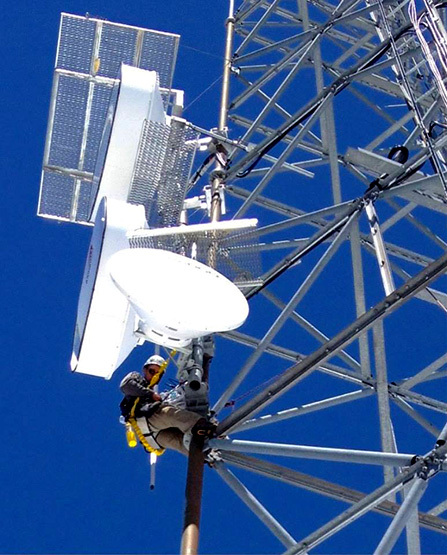 SkyConnect is available from multiple tower locations in the Flathead Valley. Enter your address in our ordering system to see if your location falls within any of the coverage areas. Contact us if you have questions about future deployments in your area. Custom solutions and speeds may be available for special business needs. MontanaSky's Premium Connections offer performance and reliability that were once only found in major metropolitan markets. MontanaSky's Premium Connections offer performance and reliability that were once only found in major metropolitan markets. These connections do not share pools of data with other customers. The amount of bandwidth you purchase is completely reserved for your business. Premium connections are secure, scalable, and offer bandwidth's all the way up to 10Gbps. Fiber Optic cable has long been the gold standard for fast, reliable, Internet. It allows data to move at the speed of light and that enables the smoothest Cloud experience. 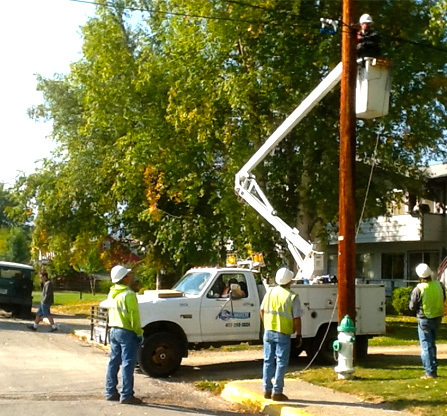 At MontanaSky Networks, we are continually expanding our Fiber Optics footprint. MontanaSky owns, or has access to Fiber Optics along many of the major routes and a growing number of residential neighborhoods. Fiber Optics Quotes require a site survey and custom ATC (Aid To Constrution) quote. ATC cost can range from $3,000 to $150,000 or more depending on the distance from nearest break-out point to your facility and the complexity of the installation. Aerial construction is is less costly than underground but may require pole engineering/replacement and permitting. After installation, there is a base "port-fee" and then the bandwidth price depends on what speed you choose. Fiber speeds are the same up-link and down-link. (Synchronous). Call us for Fiber Optics availability and a custom quote. If the cost of Fber is prohibitive because of your distance from our backbone, Fiber Over-The-Air maybe the answer. If the cost of Fiber is prohibitive because of your distance from our backbone, Fiber Over-The-Air may be the answer. Fiber OTA uses FCC licensed microwave technology that banking institutions and high tech companies have used for years. Broadcast from Big Mountain, Lone Pine, Blacktail Mountain, and Columbia Falls, MontanaSky can reach almost any location in the Flathead Valley. Depending on your location, a less costly wireless solution that does not need a license may be available. As new and better technology comes on the market, MontanaSky contines to research and evaluate the best ways to get high quality connectivity to Montana at a reasonable price. Let us know where you are located, and we will give you a quote.